Santorini villas from Villas Worldwide. Located at the southern extremity of the Cyclades group of Greek islands Santorini is an island of great spectacle, dramatic history, geology and legend. Believed to be the site of the legendary lost city of Atlantis it is the site of one of the most inspiring archeological sites in the Cyclades, Akrotiri. 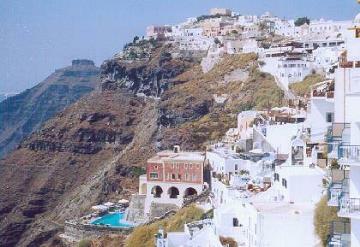 The islands capital is Fira, also known as Thira. A most spectacular place, it is perched on the cliffs overlooking the small port of Skala Firon which can be accessed by cable car or steps on the back of a mule. The villages terraces are packed with hotels, bars and restaurants commanding spectacular views from the volcanic cliffs over the islands central caldera. We have 1 villas in Santorini. Back in 1450 BC the island muted into its current form when the circular volcano of which it is composed erupted creating a colossal explosion which blew out the middle. This left a huge crater (cadera) which suddenly filled with water causing a tsunami which devastated Minoan Crete. Subsequent volcanic activity in 197 BC and 1707 led to the emergence of the central islands of Palaia Kameni and Nea Kameni which are still volcanically active today. And thus the island acquired its archipelago form and hence the black beaches.